The Department of Mathematics Undergraduate Program is one of the largest in Vanderbilt’s College of Arts and Science in terms of the number of credit hours taught and provides many opportunities for immersion in mathematics beyond the approximately 150 classes offered each year. Students may choose to pursue an honors program, engage in research, and participate in a variety of extracurricular activities such as the Math Club, the Undergraduate Seminar, and the Actuarial Science Club. We also have an active chapter of Pi Mu Epsilon, the national mathematics honor society. 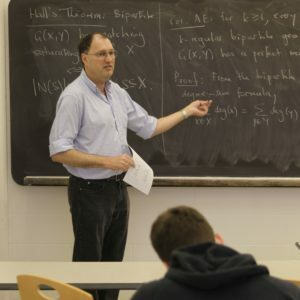 Our faculty include two winners of the prestigious Jeffrey Nordhaus Award for Excellence in Undergraduate Teaching, and we take pride in the fact that more than 100 mathematics majors are graduating annually. You can learn more about our many exciting programs and opportunities by exploring this Undergraduate section of our website.